5TH BATTALION NORTH LANCASHIRE REGIMENT T.F. Ziba the second son of Mr & Mrs Z Sones of Townsend Villa, Chediston Street had received his education at Framlingham College before joining the family Boot and Shoe manufacturing business at No.3 Thoroughfare. 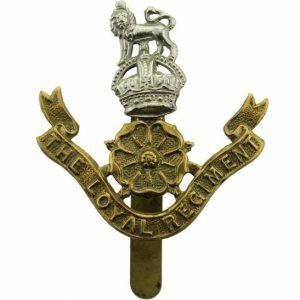 In May 1916 he had enlisted into the 21st Glamorgan Yeomanry who were based in and around the town and with whom he had a close relationship often performing with their concert party. 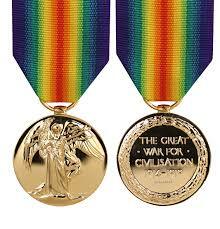 Within a year he had been commissioned joining his new regiment in France in October 1917. Just six months later he was dead, the circumstances of his death were explained to his widow Minnie by a brother officer who wrote that Ziba had met a gallant end whilst proceeding along the front line trench comforting his men during a fierce artillery bombardment, when he was struck by a shell, At the time of his death he was one of the oldest of the Halesworth casualties being in his 39th year. 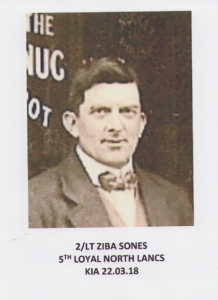 Ziba is also remembered on the Holton War Memorial.